You were brought to the hospital with symptoms like pain or numbness in your legs, weakness or heaviness in your buttocks or legs and problems emptying or controlling your bladder and bowel. You had more problems when you were standing or walking. Doctors after thorough evaluation found that your spinal nerves were being compressed by some damaged bones in your spinal cord. Doctors thus advised you to undergo a laminectomy surgery to relieve from those symptoms. 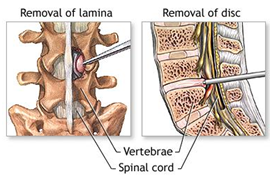 Laminectomy is a surgical procedure where in a part of the backbone called lamina is removed to relieve the compression on spinal cord or nerve roots. The procedure removes bones and damaged disks, and makes more room for your spinal nerve and column. You have undergone laminectomy surgery when you were in the hospital. - The surgeon made a straight incision over the affected section of the spine and down to the lamina, the bony arch of your vertebra. - The ligament joining the lamina was removed to view the affected nerve root. - The damaged bones in your spinal cord were then removed to relieve the pressure on your spinal nerves. -	Continue to take your medications as ordered, especially the full course of antibiotics. -	Avoid activities that strain the spine such as sitting or standing for too long, flexing your spine, bending at the waist, climbing too many stairs or going for long trips in the car. -	Avoid wearing high-heeled shoes. -	Sleep on a firm mattress. -	Continue with any exercises you were shown in hospital. Gradually increase them, although if you develop pain, stop the activity. -	Beware of lifting, bending or twisting. -	Be guided by your physiotherapist and doctor as to what specific activities you can and can't do, including walking and driving. -	Report any signs of infection to your doctor, such as wound redness or seeping, elevated temperature or persistent headaches. Mild back pain may persist for few weeks. As the tissues heal the pain will subside; do not panic. However be guided by your doctor and your physiotherapist and try to be ambulant under guidance based on your neurological status (strength in limbs). -	A return of back pain in the future. -	Your back pain begins to worsen and does not get better with rest and pain medicines. -	You are having difficulty urinating and controlling your bowel movements. -	Wear brace as suggested. -	Avoid lifting weights up to 3 months. -	Full cover up for pain medication for the first 15 days. Follow your doctor's instructions. -	You can have normal diet that is easily digested. You will need to change how you do some things. Try not to sit for longer than 20 or 30 minutes at one time. Sleep in any position that does not cause back pain. - You may void wearing the brace when you sit on the side of the bed for a short period of time or use the bathroom at night. Do not to bend at the waist. Instead, bend your knees and squat down to pick up something.